Talk about filling in a big hole in my gaming history. I've never played any of the Castlevania games before now. Nope, not a single one. There have been enough of them as well... it's one of the most famous and long-running franchises in gaming history! Actually, I tell a lie... I did play Curse of Darkness on the PS2, but I don't feel that's truly in the spirit of the Castlevania series, and so I thought I'd go waaaay back in time to the very first game, where it all began. 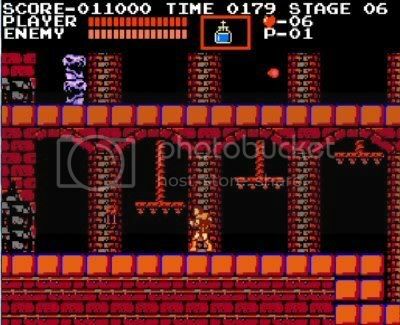 I've read over the years about the depth in Castlevania games, with a variety of weapons, armour and other items to collect and use. As it happens, the first in the series is a fair bit like Ghosts 'N' Goblins in many ways. That's in no way a bad thing... Ghosts 'N' Goblins is great. This game is an action platformer which sees you fighting your way through a spooky castle, using your whip and other collectable weapons to defeat bats, big cats, bouncing Medusa heads, suits of armour and many more castle denizens. You've also got your fair share of jumping and ducking to do, and all within a fairly strict time limit. Add a healthy number of hidden and secret items and bonuses to find and a high score to achieve, and you've got a game that's a lot of fun to play. I'm sorry that I didn't play a Castlevania game earlier. The series is a classic, this one is very entertaining indeed and I'm sure they get better as they go on, although the RPG elements of later games are sure to change the dynamic somewhat. I'd definitely recommend you play this if you haven't before... it's a bona fide piece of gaming history, and it still plays pretty well today.